Our Essential Tea Starter Set is just that – a fabulous set of the essentials! This collection will get you off to a cracking start to enjoy our amazing loose leaf tea blends. It has everything you need to infuse our tea to timely perfection. Our must-have infuser teapot, tea-timer and Tea Guide will keep you on track with all you need to know. Where would an Essential Tea Starter Set be without our staple loose leaf Breakfast Blend and Blooming Marvellous Tea? 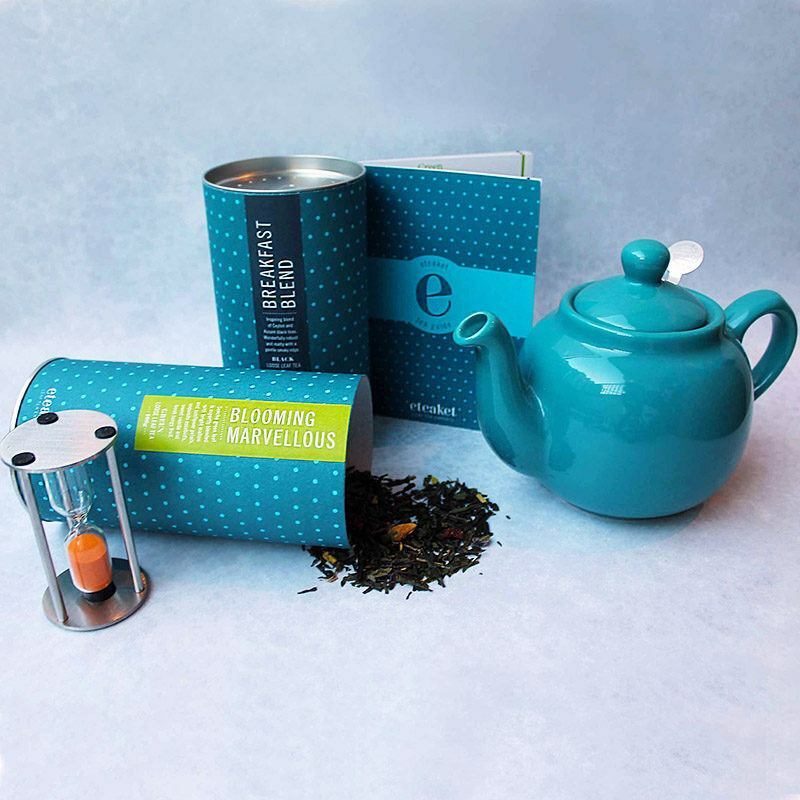 They are definitely essentials for us here at eteaket and soon they will be for you too! Our teapots come in a wonderful array of colours. Pick your favourite one for your starter set. Save with this amazing set for only £34.95! Our Breakfast Blend black tea is an inspiring and invigorating blend of hand picked Ceylon and Assam black teas. This is our ‘regular cuppa’ although there is nothing regular about this tea, it is wonderfully robust and malty with a gentle smoky edge and a hint of oak. Our Blooming Marvellous is just that… blooming marvellous! Flavoured Sencha green leaf is expertly blended with bright mallow and sunflower petals, exquisite rosebuds, sweet vanilla and fresh tangy fruit. Creating a sweet and slightly floral green tea with bags of taste and personality! Due to popular demand we are now selling the lovely eteaket teapot we use in our tea room and have included it here in our Essential Tea Starter Set! The eteaket teapot is a great pot for one – or two if you’re the sharing sort. It has a removable stainless steel infuser – perfect for loose leaf tea! It holds 600ml. Use one scoop of tea per pot (our perfect tea measure is…well perfect for this) bring water to the boil, pour on the tea and allow to brew. our tea timer included in this fantastic set will let you know when you’re ready to pop out the removable metal infuser. It means that you will always have the perfect teapot of tea. Available in a range of colours, select your favourite for your Essential Tea Starter Set! Our fabulous Tea Guide is also included, ensuring you have a perfect infusion every time and sharing wonderful knowledge of everything tea!